This Is Where Modern Software Meets Business Expertise. We built our software on the latest industry standards, and structured it on proven marketing and business philosophies so you can launch your viral mailer into the modern world. Our software is built with HTML5 and passes both the mobile-friendly test as well as web standards compliance so your customers can reach your site wherever they are. The comprehensive Affiliate Toolbox system is designed to bring in new clients, while our SalesGlance tool provides insight into how each of your products are selling at any given moment. Design and build your own viral mailer website. Empower others to build their own mailing list and grow yours at the same time. Be at the very top of everyone's downline. Powerful credit-based system ensures more subscribers actually READ your emails. Provides all the features of an LFM website, including One Time Offers, Login Offers, and an instant payment system. Get access to our exclusive community of LFM owners and learn from experienced online business owners. Why Launch A Viral Mailer? But the PROBLEM is that creating and managing a membership site that people want to keep using is sometimes difficult because you have to keep driving traffic to it to make sales and replace those that dropped out of the subscription. What you really need is a monthly membership site that delivers a service for your members that makes them want to login everyday and use it. And that's exactly what we built LFMVM to do. The LFMVM community includes conferences every month, a Facebook fan page, an LFMVM owners Skype group and a support network of users that complements our customer support services. Our viral mailer community is always happy to welcome new members, primarily because we all understand the strength that comes from working together as a group. Have An Existing Viral Mailer? We can handle the transfer of your data and customer details to your new LFMVM site. We have "done for you" solutions available to purchase and can even arrange your hosting. If you're not sure how to use an LFMVM feature, you can use our support system to get all the answers you need. 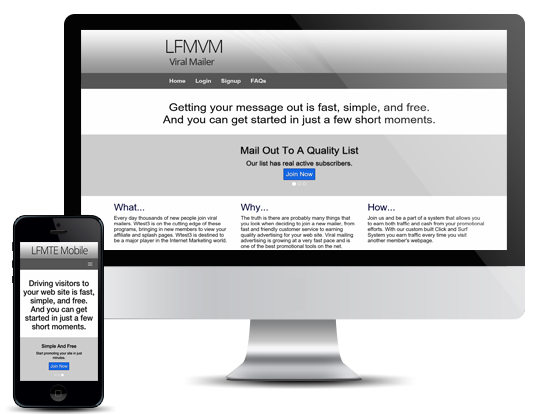 Get the complete LFMVM script to run your own viral mailer. Founded in 2012, LFMVM now powers hundreds of viral mailers. © 2016 Josh Abbott and Robert Puddy. All rights reserved.